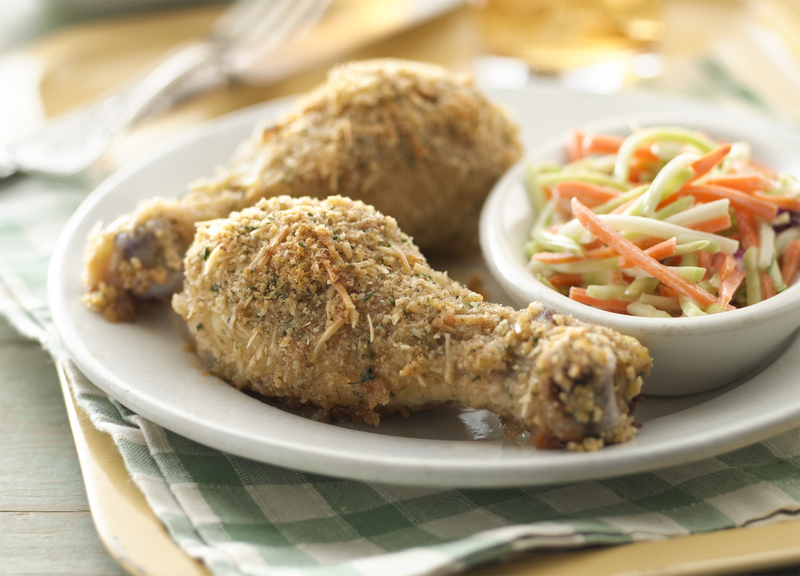 This dish is loaded with crunch and flavor; it works with almost any cut of chicken, but is especially delicious with drumsticks. Preheat oven to 350°F. Line a rimmed baking sheet with foil. Lightly coat with cooking spray. Stir together bread crumbs, Parmesan cheese, parsley, and salt in a shallow bowl. Pour butter into a separate shallow bowl. Place chicken in a single layer on prepared baking sheet. Drizzle remaining butter over chicken. Bake for 45 to 50 minutes or until the chicken is well browned and thoroughly cooked. If substituting bone-in thighs, boneless skinless thighs or boneless skinless breasts, double the quantities for this recipe.